Although St. Louis’s 67-66 record puts them 5.0 games out of a Wild Card berth, our projections continue to give them a still-realistic 13.0% chance at cracking the playoffs due to the talent on their roster. Mike Leake wasn’t helping much, as the veteran righty had allowed at least four runs in each of his last four starts, yielding a protuberant 10.24 ERA. St. Louis had apparently seen enough, trading Leake to Seattle. In his place, they’ve called up top prospect Jack Flaherty to make his major-league debut tonight at San Francisco. Flaherty ranked No. 57 on Eric Longenhagen’s updated top-100 list. Flaherty was nothing short of excellent in the minors this year, pitching to a stellar 2.18 ERA in 25 starts between Double-A and Triple-A. Most impressively, he struck out 25% of opposing batters while walking just 6%. If you’re looking for a nit to pick, it’s that Flaherty isn’t much of a ground-ball pitcher and, largely as a result, was a little homer-prone in his 15 Triple-A starts. But otherwise, his recent minor-league track record is impeccable. Flaherty’s performance has been great, but his age makes his profile really pop. Just 21 years old, he’ll become the third-youngest major-league pitcher this year, edged out only by Julio Urias and Francis Martes. Flaherty’s even younger than many of the players drafted two months ago, including Kyle Wright, David Peterson, Logan Warmoth and Alex Lange. 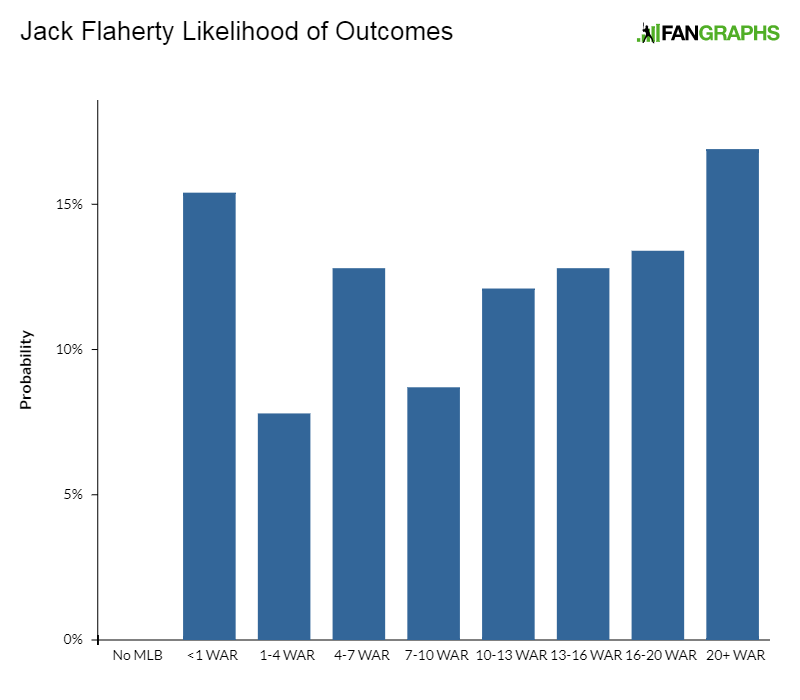 Very few 21-year-olds are capable of pitching as effectively as Flaherty has. My KATOH system pegs Flaherty for 8.1 WAR over his first six seasons by the stats-only method and 8.4 WAR by KATOH+, which incorporates his Baseball America ranking. The latter puts him No. 29 overall and No. 5 among pitching prospects. To put some faces to Flaherty’s statistical profile, let’s generate some statistical comps. I calculated a Mahalanobis distance between Flaherty’s Triple-A performance and every Triple-A season since 1991. In the table below, you’ll find the 10 most similar seasons, ranked from most to least similar. The WAR totals refer to each player’s first six seasons in the major leagues. Please note that the Mahalanobis analysis is separate from KATOH. KATOH relies on macro-level trends, rather than comps. The fates of a few statistically similar players shouldn’t be used to draw sweeping conclusions about a prospect’s future. For this reason, I recommend using a player’s KATOH forecast to assess his future potential. The comps give us some interesting names that sometimes feel spot-on, but they’re mostly just there for fun. In the here and now, the Cardinals are likely hoping Flaherty can give them 5+ innings every fifth day for the month of September. The 2017 Cardinals need every win they can get, and Flaherty figures to help that cause, even if he only matches his 4.33 Steamer projection. But looking at the the longer-term, Flaherty is one of the most promising young pitchers on the planet by my math. He could be a fixture in St. Louis’ rotation for years to come. We hoped you liked reading Projecting Jack Flaherty by Chris Mitchell! 5th paragraph says “Moncada” just fyi, Chris. Thanks for the write up.